Don’t throw away those old sweaters! 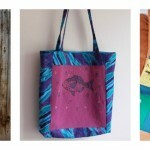 Feed your thrifty side and learn to refashion them into a beautiful bag. 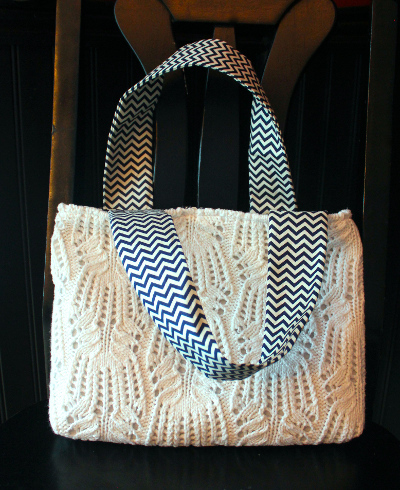 Today Maureen Wilson from Made By Marzipan shares this tutorial on how to transform an old sweater into a bag. Have an old sweater on hand? I’ll show you how to transform it into an adorable handbag. I’ll provide the measurements of my bag, although you can certainly make your bag larger or smaller. Just be sure that you cut all of your fabric pieces the same size as your cut sweater pieces. 1) Begin by cutting through both layers of the sweater to make two rectangles. Mine are 14 inches wide by 11 inches high. 2) Cut two pieces of iron-on interfacing to these dimensions as well. 3) You’ll also need three cotton rectangles cut to this size. 4) Fold one of these cotton rectangles in half lengthwise, wrong-sides together. Press the fold. 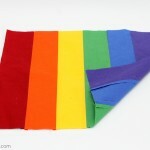 5) Pin the folded rectangle to a full-size cotton rectangle, aligning the raw edges at bottom. This will become the pocket pouch. 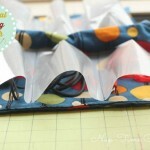 6) Sew along the edges of the folded rectangle with a 1/4 inch seam, leaving the fold at top open. 7) You can then create smaller pockets by stitching vertically down the middle of the folded rectangle. I divided mine into thirds, sewing two center lines to create three small pockets. 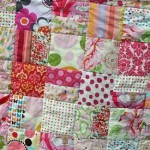 8) Layer the two cotton rectangles right-sides together and pin. 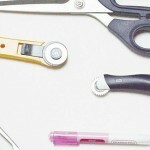 9) Start sewing ½ inch from the top edge, sewing the sides and bottom with a ½ inch seam. Stop sewing ½ inch from the top edge, leaving the top unsewn. 10) Now we’ll work on the outer bag. Iron the interfacing to the wrong side of the sweater pieces. 11) Layer the two sweater pieces right-sides together and pin. 12) Sew exactly as you did the lining. 13) Next we’ll form the corners on the bag pieces. With the bag inside out, slide your hand into the bag and place your fingers in the corner. Flatten the corner into a point. Pin horizontally, 1 ½ inch below the top of the point. 14) Sew horizontally through all the layers where you had pinned. 15) Turn the bag right side out to double check your work, then snip off the excess fabric at the point. 16) Repeat these steps to form corners on the other bag piece. 18) Iron the interfacing to the wrong side of the strap pieces, then fold in half, right-sides together. Press the fold. 19) Sew along the raw edge with a ¼ inch seam. 20) Turn the straps right side out and press. 21) It’s time to put it all together! Turn over the top raw edge of your bag pieces about ½ inch and pin. 22) Use a wide, loose basting stitch to hold the edge in place. Do this on both bag pieces. 23) Slide the lining into the outer bag. 24) Insert the ends of the straps between the two bag pieces. 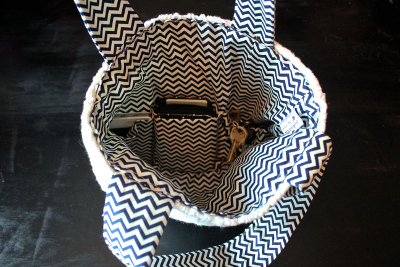 Place the ends of the straps about 1 ½ inches below the edge of the bag for extra durability. Pin the straps in place, then continue pinning the lining and outer bag pieces together. 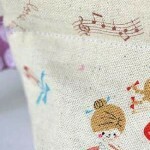 25) Sew together with a ¼ inch seam, just slightly above your basting stitches. 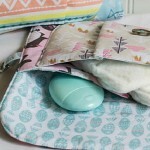 26) Unpick the basting stitches, and your bag is finished! 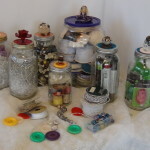 For more great thrifty ideas, visit our sister site Cheap Eats and Thrifty Crafts. You’ll learn money-saving hacks and cost-effective recipes that can save you lots of money (this is the most expensive time of year, after all!). What have you made with a sweater?